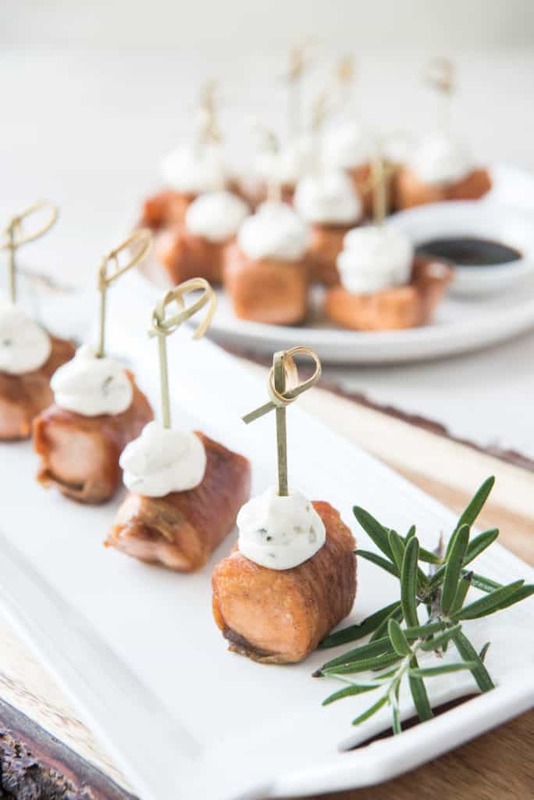 This Prosciutto Wrapped Salmon Appetizer completely exceeded our expectations! It’s literally just 3 ingredients (salmon, prosciutto, and butter) with an optional cream cheese herb mixture topping. I think we've just created the easiest, restaurant quality appetizer that is literally made in minutes. You can even cheat and buy store bought herb cream cheese to pair alongside this pan seared salmon. How will you know when the salmon is fully cooked? Well, technically once the salmon reaches an internal temperature of 145F the fish is fully cooked. However, we’re working with small pieces of fish and we’ve discovered an easier way to tell when the salmon is fully cooked. The best way to tell is to allow your salmon to cook until it's white half way up, then flip and cook some more - you'll get it perfect every time! Depending on how big of pieces you cut the salmon into, you may need to cook it a little on each of the sides. The salmon should become flaky once fully cooked and the prosciutto will be nice and crispy on the outside. Some of our favorite salmon recipes from the past are our salmon poke bowls, which were inspired by our trip to Hawaii, and our garlic butter salmon with asparagus. It's the perfect, simple dinner for any night of the week! We are so in love with the ease and quickness of this salmon appetizer. You know we are food connoisseurs, and if you like this super easy keto appetizer then we’re sure you’ll love these other low carb appetizers too! 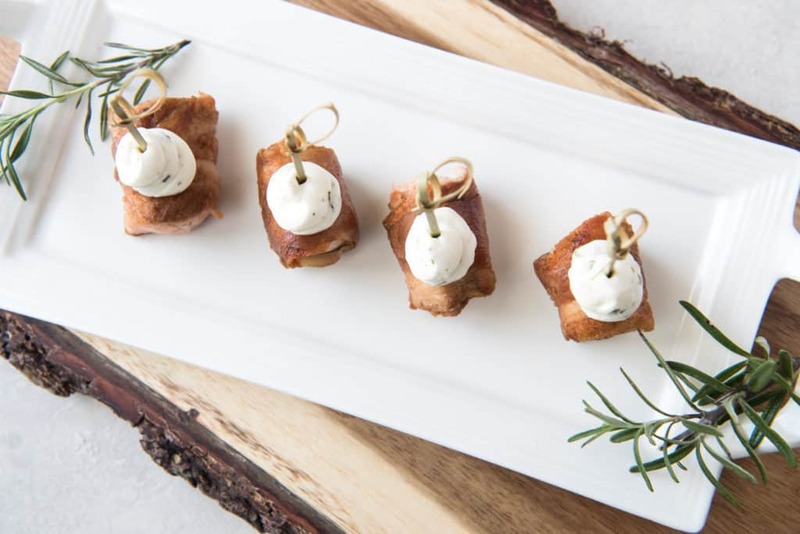 With appetizers this fancy looking and easy to make you no longer have to stress about dinner parties! We've got you covered in the "impress your friends" and flavor department. You can even test this salmon appetizer out tonight on your family to see what they think of your new 5-star quality restaurant skills! Recipe can be quickly added to MyFitnessPal - Search "KetoConnect - Prosciutto Wrapped Salmon"
Heat a large skillet over medium heat and add 3 tbsp butter. Slice the salmon into 1x2 inch chunks and slice the prosciutto slices in half lengthwise. Wrap Salmon chunks in prosciutto and place prosciutto wrapped salmon chunks in heated skillet. Cook approximately 2 minutes then flip (salmon should turn white-ish about half way up). Cook for another 2 minutes. Depending on thickness you may need to cook for an additional minute or two on the sides to ensure salmon is fully cooked. While salmon is cooking, combine all ingredients for the cream cheese into a bowl and mix until well combined. If desired, dollop the cream cheese mixture on top of salmon bites once salmon is completely cooked. Prosciutto should be nice and crispy. You can also serve the mixture alongside the salmon as an appetizer! Best stored in an air tight container up to 2 days. Enjoy!